Save money and avoid the hassle of multiple loans with one blanket loan to cover several home purchases. A blanket loan is a type of loan which covers multiple home purchases. Most conventional home loans are tied to a single piece of property and have what is called a close with title clause, which means that if the property is sold the loan must be paid off with those funds. Blanket loans are not tied to one specific property, and the borrower is capable of selling some of the property the loan was used for, so long as the borrower still has enough collateral to cover the balance of the loan. These loans streamline your finances, give you more flexibility and are more cost-effective than several smaller mortgages. While blanket loans can be useful to anyone who owns two or more homes, they primarily used by real estate developers and investors. Below we break down some of the key aspects of blanket loans to see if its the right fit for you. The interest rates for blanket loans are comparable to conventional home loans and are affected by the same factors like how strong your credit score is, how stable your employment history has been, your debt to income ratio, the current prime interest rate, and the stability of the value of your collateral. 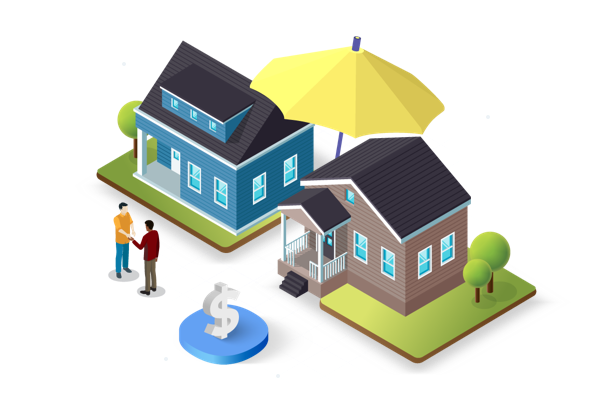 Typically blanket loans are offered with slightly lower interest rates because using several pieces of real estate as collateral is more stable than a single home. The most significant difference between getting a blanket loan and getting a separate mortgage for every property is in the fees. For every mortgage, there are underwriting fees, which pay the lender for the administrative work of creating the mortgage agreement. However, if you get a blanket loan, you could pay one underwriting fee for six properties, as opposed to paying six separate times. This combined with frequently discounted assessment fees leads to significant savings. Since blanket loans are so large, their credit requirements are higher as well. Most lenders base the credit requirements on the size of the down payment. To get a blanket loan with a 25% down payment you typically need to have a credit score of at least 680. For a loan with a 35% down payment some lenders will accept a credit score of 670. If your credit score is below 670, you would need to pay 45% down, and blanket loans are rarely granted to anyone whose credit score is less than 660. Laws around blanket loans differ somewhat between states, but most states do not allow lenders to give blanket loans to applicants with credit scores below 620. Blanket loans have very high standards; applicants are often denied even when they meet all of the basic requirements. First, you will need to find a lender who provides them, many traditional banks do not, although they are more common among commercial banks. Since these are large loans, there is increased scrutiny which leads to increased paperwork. Be prepared to provide credit and employment history. If buying and selling homes is part of your business be sure to have an airtight business plan. Also be prepared to be rejected by some lenders even if you have a strong case. If you are rejected, take a look at your case and see if there’s anything that can be improved on. After you've made the improvements or if there's nothing that can be improved, apply to another lender and hope you have better luck. After you receive pre-approval the property you wish to use this loan on will be assessed. If their assessment agrees with the amount that you’re asking for you should be approved. Getting approved for any loan can take time. Patience is key, as is making sure you've compared as many options as you can to be sure you're getting set up with the right lender for your situation. Hang in there and take your time and before you know it you'll be on your way to a great investment.